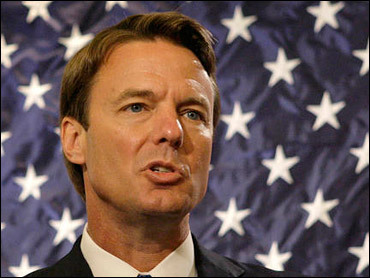 A $14,000 payment to John Edwards' mistress from the candidate's political action committee - after she stopped working for it - was made in exchange for 100 hours of unused videotape she shot producing short Web movies for which she already had been paid $100,000, an associate of Edwards told The Associated Press. But the earlier, $14,000 payment to Hunter is significant because its source was Edwards' OneAmerica political action committee, whose expenditures are governed by U.S. election laws. Willfully converting money from a political action committee for personal use would have been a federal criminal violation. When Hunter provided the last of over 100 hours of footage, the firm was paid as contracted for, said the associate. Legal experts said it was important for Edwards to demonstrate the PAC wasn't paying Hunter merely to keep quiet about the affair. "One thing that's possible is that she was still owed money from what she'd done before for the political action committee, but obviously there are less charitable explanations," said Richard Hasen, a professor specializing in campaign finance law at Loyola Law School in Los Angeles. Edwards said several times in an Aug. 8 interview with ABC News the affair was short-lived. But there is evidence that Edwards and Hunter spent months together in 2006, traveling the world and the country as he prepared for his second run for the White House. One of Hunter's friends, Pigeon O'Brien, told the AP that Hunter told her the affair with "John from North Carolina," who was married to a woman who had been seriously ill, began in March 2006. That conflicts with Edwards' statement the affairs started only after he hired her to produce several videos for his Web site, the first payment for which came in July 2006. It appears from her videos that she accompanied him on several trips during the summer and into the fall: to Pittsburgh for a rally against Wal-mart Stores Inc., to Iowa for a speech to an education group, to New York for an appearance on "The Daily Show with John Stewart." She also apparently tagged along during a five-day trip to the African nation of Uganda. Edwards said several times during his interview with ABC the affair ended in 2006, when he confessed to his wife Elizabeth that he had "made a very serious mistake, a mistake that I am responsible for, and no one else." "And then she forgave me, and we went to work on it," Edwards said. But Hunter was still hanging around Edwards late into the year. At the end of December, Hunter's videos debuted online. And a few days after Christmas, when Edwards formally entered the race for the Democratic presidential nomination, Hunter was alongside in New Orleans for the announcement. Elizabeth did not make the trip. On Dec. 29, Hunter attended and filmed a rally in New Hampshire, and flew with Edwards from there to Reno, Nev. Shortly there after, Hunter later told a Newsweek reporter, she was fired. Edwards said last week he did not plan to speak again about the affair, and a former campaign official who has been acting as a spokeswoman reiterated this week he will not discuss the subject. It's not clear where Hunter is currently living, and a woman who answered at her lawyer's office this week refused to take a message. Hunter's sister, reached at her home in Nevada, also refused to comment. "I talked to John (Tuesday) and he's not doing well," said David "Mudcat" Saunders, who served as Edwards' chief adviser on rural affairs. "He's just - to be very frank with you - he's just not doing well. He needs to be concentrating on himself and his family at this point in his life. He's a good boy. He just made a hell of a mistake." Edwards has denied Hunter was paid to cover up the affair, and said he had no knowledge that Baron was sending money to both her and a married Edwards staffer who later claimed to be the father of Hunter's daughter. She was born in February 2008. In a brief interview this week, Baron reiterated that Edwards and his wife were not involved with his actions. He said no campaign funds were used and that Hunter was not working for the campaign when he started giving her money. "The bottom line to it is John Edwards and Elizabeth Edwards had no knowledge of anything I did," Baron said. "I did it as a friend."